It’s one thing to be a star. It’s another thing to be an All Star. And Ginger Minj is an All Star. 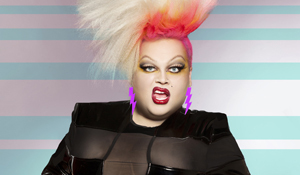 Fresh from her appearance on Logo’s hit series RuPaul’s Drag Race All-Stars 2, Ginger Minj celebrates her debut album, Sweet T, with an intimate show at the Laurie Beechman Theatre. With a song in heart and a plethora of stories at the ready, Ginger Minj: The Album Premiere is a stripped down evening, literally. There’s only so much of a person that can be portrayed on screen so Ginger Minj shares a piece of herself that we didn’t see, all while celebrating her crowning achievement. With a set list of six original songs and covers, what sets this show apart is how emotionally raw her performance is. On the show, Ginger Minj is a self-proclaimed glamour toad. We know her for her quick, biting tongue. But the man within the girl gets the spotlight here. From stories about her drag inspirations to a touching tribute to her late grandfather, Ginger bares all. What’s exciting about the show is Ginger displays the talent we never got to fully see on the show. We know she has a voice but there’s a fabulous grit to that growl when hearing it live. Her vocals live in that classic Broadway style that melts into modern pop. She is a divine diva in drag. Her look, a fiery red wig and an edgy punk inspired outfit, wasn’t what we would expect from her. To match her pop diva voice, a nice dress a la Adele or Celine Dion would have made the night complete. Separated into chapters, Ginger elegantly allows the evening to flow. She warns that she will share her true self with the audience but what drag queen is actually going to take it all off on stage in front of an audience? A brave and courageous one. And that is exactly who Joshua Eads is. Brave and courageous with a confidence one longs for. Watching Ginger transform back into Joshua in front of our eyes was quite possibly one of the most beautiful moments to ever grace the stage at the Laurie Beechman. Ginger Minj is the perfect reality tv character. She gives you sass and soundbites for days. But there is more than meets the eye. And Ginger Minj: The Album Premiere proves that. IF you haven’t heard Sweet T, I urge you.